Only a few miles south of Fort Myers beach and north of Bonita Beach. 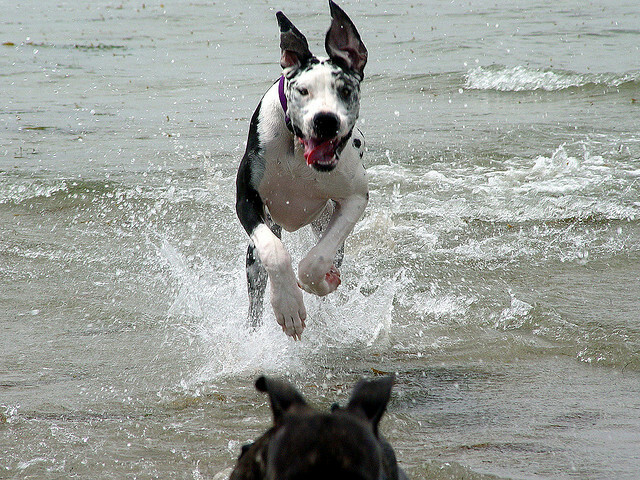 Dog Beach is one of the very few off-leash beaches in the region. A real doggie heaven this is the perfect place to take your four-legged best friend for a fun day of running along the beach, swimming in the blue waters of the Gulf of Mexico and playing with new furry friends. Located on what is more of a sandbar or small island it’s the perfect place for dogs to run freely without wondering off. 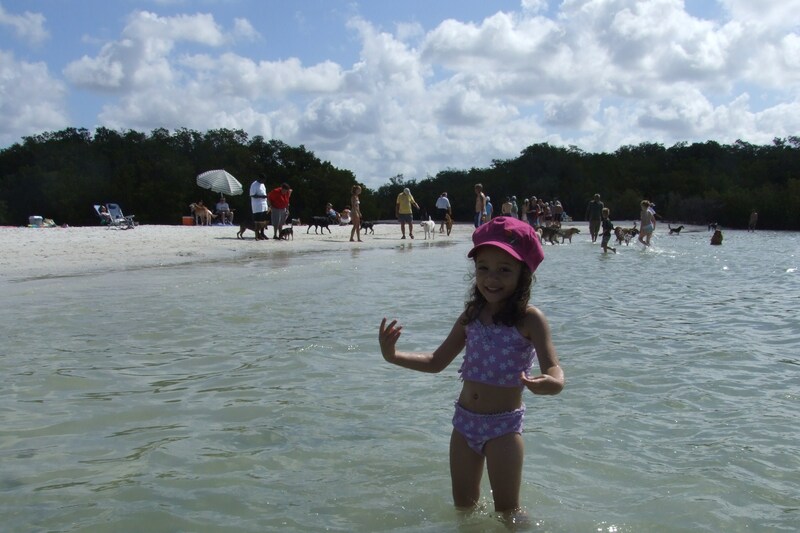 Do take into account that the size of the beach varies according to the tides and water level and if you go there in high tide you will find yourself having to cross a few feet of muddy trail to get to the beach or get back to your car. The dogs really have an awesome time and you can see them playing in groups of new friends, swimming and running. The small island beach can get pretty crowded on weekends and in season and the doggies pee and poop in or near the water. Be very vigilant of your towel, cooler or other beach gear as doggies like to mark their territory and I have seen quite a few dogs dogs peeing on other people’s things. I would not recommend walking on the beach without shoes. 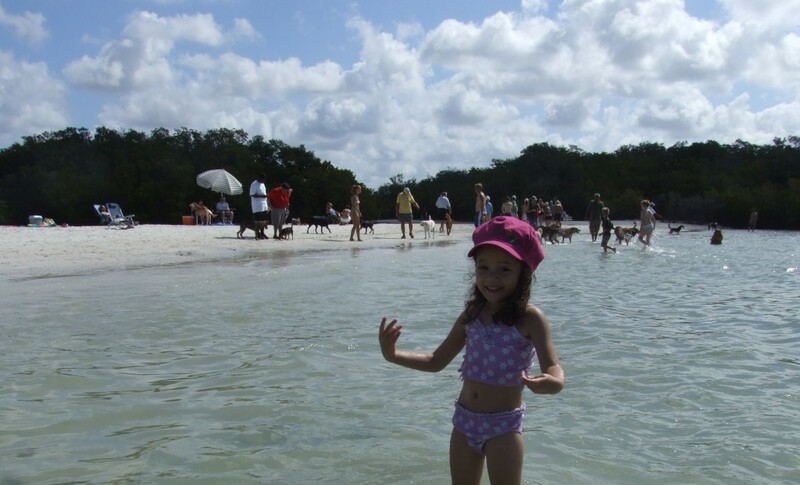 Dog beach is very close to Lover’s Beach State Park and the are is a natural preserve so mosquitoes and noseeums may be a nuisance specially in mosquito season and during dusk and dawn, so make sure to bring your bug spray. Dog Beach is recognized by Lee County Parks and Recreation, though the park system provides no facilities or amenities. There are no restrooms except for portable toilette and pet owners are responsible to pick after their dogs and control them. However there is a doggie shower station, recently provided by a private donor. My little girl having a great time at Dog Beach. Photo: Paula Bendfeldt-Diaz. All Rights Reserved. You must be 15 years or older to bring a dog, and may bring no more than two dogs. Children under 5 are not allowed on the off-leash area. Non-neutered, non-spayed, aggressive or sick dogs are prohibited from entering the beach area. You can download a complete set of rules for all of Lee County’s dog friendly facilities, including Dog Beach HERE. It is recommended that you keep an eye on your pet so that it doesn’t pee on someone’s towel or cooler, which happens frequently. Don’t forget to bring bug spray and lots of drinking water for your dog who will probably spend hours running and swimming. The beach is accessible by car or boat and parking is FREE. Dog Beach is open from dawn to dusk. Heading north on Highway 41, make a left on Bonita Beach Road, which turns into Hickory Boulevard. Look for the Dog Beach sign on the left. I love it when communities have parks and beaches available for pet lovers to enjoy with their pets. Great that this beach has a doggie shower too. Very generous of the donor. I think that is a great idea, to have a doggy beach… I will have to see if there is one here in SC… I know my dogs would love it.. Thank you for sharing this..
My dog would love going to a dog beach. We have one here in the part of CA that I live in but I’ve never taken him. Looks like a super fun place! Wish we had something like this closer to home! We love taking our dog to places like that! Thanks for sharing! Looks like a awesome time wish we had a closer place to go to the beach .